Lisa writes, "Hi. 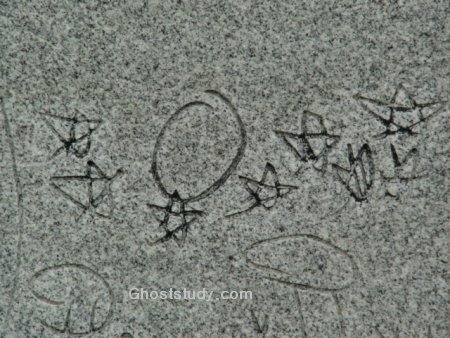 These pictures were taken at Springfield cemetery in Louisiana. 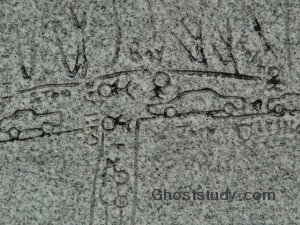 This grave stone has a very detailed 'air' view of the crime scene. This 16 yr. old boy (Michael) was murdered in his home town. He was hit by a car early in the morning when he was hunting with his dog. 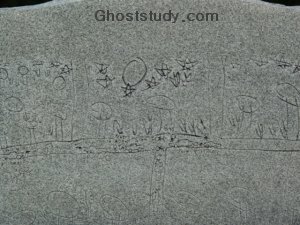 The town residents say that the tombstone engraving was done within an hour (when the mother had briefly left). Many are convinced that it was done by Michael himself after his death." Recent information has come in to suggest that Michael actually drew the scene of his death on a brown paper bag before he died. And after the family found the bag with these images, they had it etched on the back of his tombstone. So just to be fair, we are now reporting this version of the story. The entire etched scene. Click on the thumbnails below to see further details of the etching. 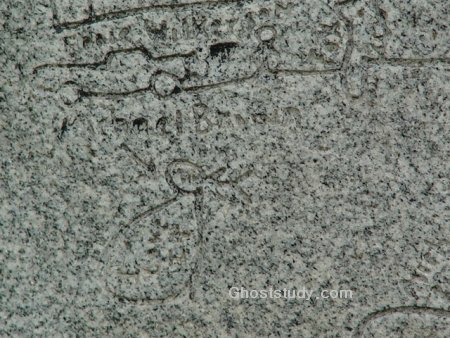 This is one of the most poignant stories we've ever received here at Ghoststudy. Michael was almost 16 when he was hit and killed by a car. 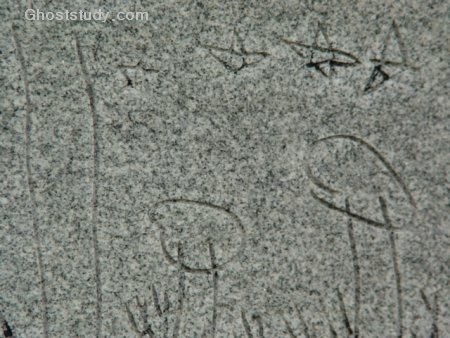 Within an hour after his gravestone was erected, an etching mysteriously appeared on the back of the gravestone. This etching was an aerial view of the place where Michael was killed. 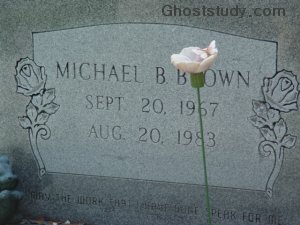 In fact, in one of the close-ups, there is an etching of person with the name Michael Brown engraved by it. The etching looks like it was drawn by a child. Was this Michael's way of coming to terms with his death, or his way of letting everyone know what really happened to him? Our thanks to Lisa for sharing this touching story with us.